Dual antiplatelet therapy in patients with STEMI—is longer treatment needed? Objective To show that limiting dual antiplatelet therapy (DAPT) to six months in patients with event-free ST-elevation myocardial infarction (STEMI) results in a non-inferior clinical outcome versus DAPT for 12 months. Design Prospective, randomised, multicentre, non-inferiority trial. Setting Patients with STEMI treated with primary percutaneous coronary intervention (PCI) and second generation zotarolimus-eluting stent. Participants Patients with STEMI aged 18 to 85 that underwent a primary PCI with the implantation of second generation drug-eluting stents were enrolled in the trial. Patients that were event-free at six months after primary PCI were randomised at this time point. 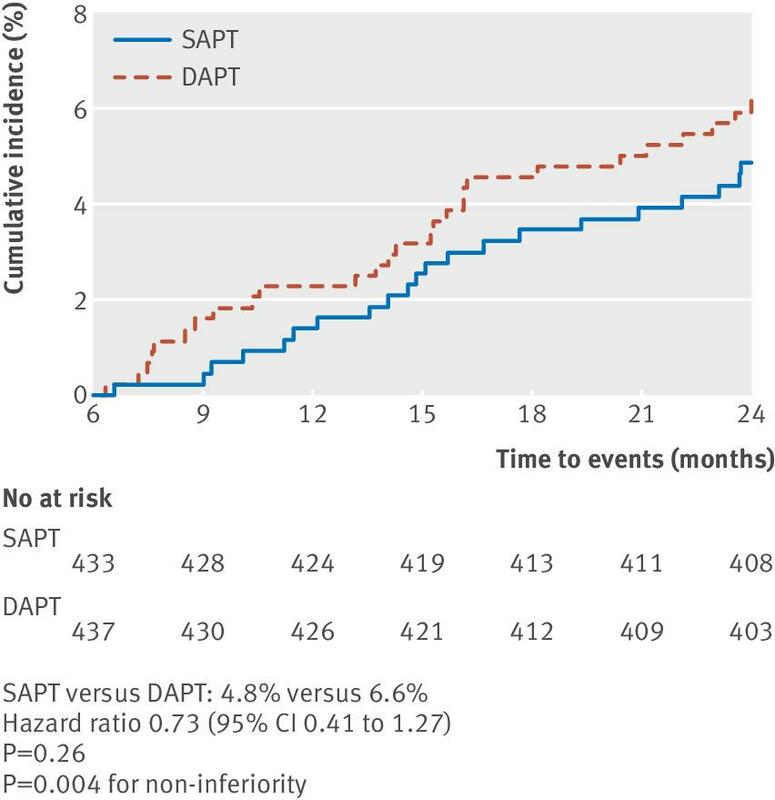 Interventions Patients that were taking DAPT and were event-free at six months were randomised 1:1 to single antiplatelet therapy (SAPT) (ie, aspirin only) or to DAPT for an additional six months. All patients that were randomised were then followed for another 18 months (ie, 24 months after the primary PCI). Main outcome measures The primary endpoint was a composite of all cause mortality, any myocardial infarction, any revascularisation, stroke, and thrombolysis in myocardial infarction major bleeding at 18 months after randomisation. Results A total of 1100 patients were enrolled in the trial between 19 December 2011 and 30 June 2015. 870 were randomised: 432 to SAPT versus 438 to DAPT. The primary endpoint occurred in 4.8% of patients receiving SAPT versus 6.6% of patients receiving DAPT (hazard ratio 0.73, 95% confidence interval 0.41 to 1.27, P=0.26). Non-inferiority was met (P=0.004 for non-inferiority), as the upper 95% confidence interval of 1.27 was smaller than the prespecified non-inferiority margin of 1.66. Conclusions DAPT to six months was non-inferior to DAPT for 12 months in patients with event-free STEMI at six months after primary PCI with second generation drug-eluting stents. Dual antiplatelet therapy (DAPT) after percutaneous coronary intervention (PCI) has been used primarily to avoid abrupt thrombotic closure of the vessel after stent implantation.1 The recommended duration of DAPT has been changed in the last decades, particularly after introduction of the first generation drug-eluting stents.2 The observed high rates of stent thrombosis with these devices motivated the interventional community to extend DAPT to 12 months,3 although there was a lack of evidence for this approach. The introduction of second generation drug-eluting stents has drastically reduced the risk of stent thrombosis compared with first generation and bare metal stents.456 Different trials and meta-analyses have shown that shorter DAPT regimens after PCI with second generation drug-eluting stents are equally safe; however, the optimal duration of DAPT remains a matter of debate.5789 Current international guidelines recommend at least six months of DAPT after PCI for stable ischaemic coronary disease and 12 months in the setting of acute myocardial infarction.1011 For acute coronary syndromes this recommendation is derived from two randomised trials.1213 However, the observed benefit was noted only in the first months and may have been biased by the positive influence of upstream preloading with DAPT. DAPT reduces the risk of thromboembolic events in general, but it is also associated with a higher risk of major bleeding that can sometimes be fatal.14 The risk of bleeding is unique to each patient and is not always known before PCI, particularly before primary PCI in the setting of a ST-elevation myocardial infarction (STEMI). So far, no trial has shown that extending DAPT from six to 12 months after primary PCI for STEMI is associated with a meaningful improvement of stent thrombosis and other safety outcomes such as myocardial infarction, stroke, or death. As the safety and efficacy profiles of second generation drug-eluting stents are superior to those of first generation drug-eluting stents and bare metal stents, and considering the unknown risk of bleeding before primary PCI, it may be appealing to consider a shorter DAPT for patients with STEMI treated with second generation drug-eluting stents. Therefore, we performed a prospective, randomised trial of six versus 12 months of DAPT after second generation drug-eluting stent implantation in patients presenting with STEMI (DAPT-STEMI trial) to evaluate whether six months of DAPT is non-inferior to 12 months of DAPT, in patients that are event-free at six months follow-up after primary PCI. The DAPT-STEMI trial is a prospective, randomised, multicentred, open label, non-inferiority trial designed to compare the clinical outcomes of six versus 12 months of duration of dual antiplatelet therapy (DAPT) in patients with ST-elevation myocardial infarction (STEMI) that underwent primary percutaneous coronary intervention (PCI) with second generation drug-eluting stents. The trial was conducted at 17 study sites in the Netherlands, Norway, Poland, and Switzerland. The study design has been reported.15 The trial was conducted in compliance with the International Conference on Harmonisation and the Declaration of Helsinki. The institutional review board of each participating institution approved the study. All the patients provided written informed consent. Data were reviewed regularly throughout the trial by an independent data and safety monitoring committee. An independent academic clinical-events committee (Diagram BV), whose members were unaware of the group assignments, adjudicated all endpoints using standard definitions (see supplementary materials, endpoint definitions). An independent, blinded core laboratory judged revascularisation and stent thrombosis endpoints. DAPT-STEMI is an investigator driven trial. The trial population consisted of patients with STEMI aged 18 to 85 who underwent a primary PCI with the implantation of second generation drug-eluting stents. Patients that fulfilled the inclusion and exclusion criteria (see supplementary materials, table e1) were enrolled after the primary PCI procedure. All patients were followed during the first six months. Patients that were event-free at six months follow-up who fulfilled the randomisation criteria were at this time point randomised to either stop or continue DAPT for an additional six months. All patients that were randomised were then followed for another 18 months (ie, 24 months after the primary PCI) (see supplementary materials, fig e1). All patients with STEMI were treated according to standard clinical practice. The choice of the vascular access route (ie, radial v femoral) was left to the discretion of the operator, although radial approach was strongly recommended to avoid bleeding complications at the puncture site. Thrombus aspiration and lesion predilatation were left to the discretion of the operator. The stent device used was the Resolute Integrity second generation zotarolimus-eluting stent (Medtronic, Santa Rosa, CA). In accordance with international revascularisation guidelines,1011 the DAPT consisted of aspirin loading dose of 150-300 mg orally or 250-500 mg intravenously followed by 75-100 mg orally daily. The P2Y12 inhibitors were prasugrel, ticagrelor, or clopidogrel. The initial dose for prasugrel was 60 mg orally followed by 10 mg orally daily. Patients aged 75 years and over and with a body weight of less than 60 kg were treated with an initial dose of 60 mg prasugrel orally followed by 5 mg prasugrel orally daily. The initial dose of ticagrelor was 180 mg orally followed by 90 mg orally twice daily. The initial dose for clopidogrel was 600 mg orally followed by 75 mg orally daily. 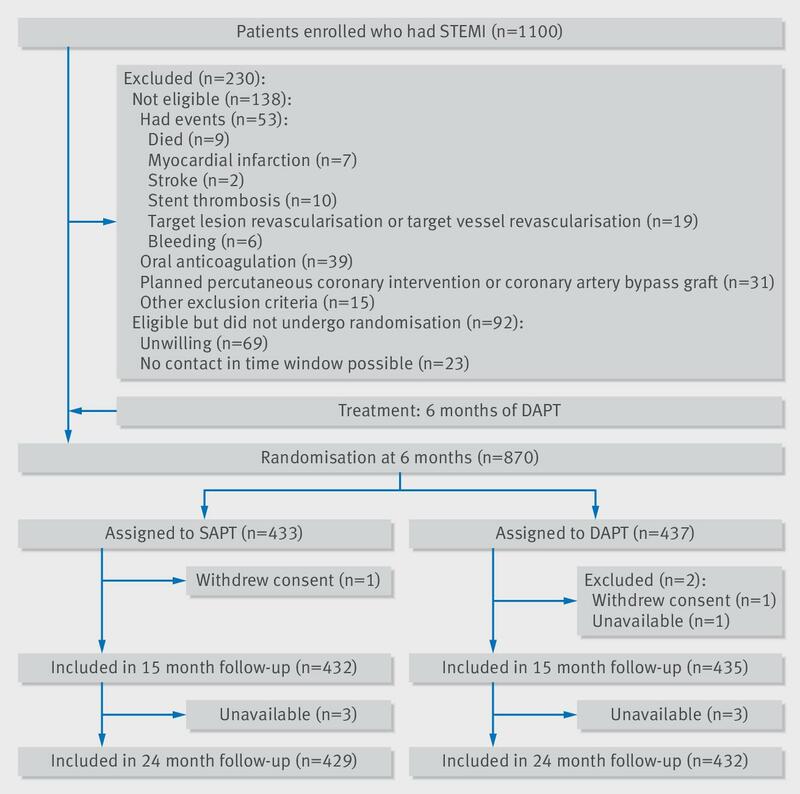 After six months, patients who fulfilled the inclusion and exclusion criteria were randomised, to either discontinue DAPT (ie, aspirin only) or continue DAPT for another six months after randomisation (ie, until 12 months after primary PCI) (see supplementary materials, fig e1). In all patients, 80-100 mg aspirin daily was continued indefinitely. If required, additional (scheduled) staged revascularisations in non-culprit lesions were performed within 45 days from the primary PCI. However, even in these cases, the time of six months follow-up was based on the date of the initial (primary) PCI. All patients that were randomised were followed for 18 months after randomisation (ie, 24 months after primary PCI). The sample size was calculated under the assumption that the α value was 0.05 for a two sided test (0.025 for a one sided test) with a power of 85%. The endpoint at 18 months after randomisation was assumed to be 15%. Taking into account the patients that were ineligible for randomisation owing to clinical events in the first six months or other exclusion criteria, a total sample size of 1100 patients was required. The primary analysis, which was performed on an intention to treat basis, included all patients that underwent randomisation, regardless of whether they received treatment. The results for the primary endpoint are presented as time to event curves (Kaplan-Meier). We based the P values comparing the clinical outcomes in the treatment groups on logrank tests. We calculated hazard ratios and corresponding 95% confidence intervals using Cox proportional hazards models. We calculated the P value for non-inferiority by testing the estimated hazard ratio against the non-inferiority hazard ratio of 1.66. We assumed an approximate posterior distribution for the treatment effect based on the estimated hazard ratio and its standard error. We used this to derive the probability that the true hazard ratio is over 1.66. All tests were two tailed and conducted at a significance level of 0.05. Data for patients that did not have an endpoint event were censored for the analysis of that endpoint at the time of the last known contact or at 18 months (ie, 24 months after the primary PCI), whichever was earlier. For descriptive purposes, a sensitivity analysis on a per protocol basis for the primary endpoint was performed. Analysis were performed with IBM statistical package for social sciences (SPSS) version 24 and SAS version 9.4 (SAS Institute, Cary, NC). No patients were involved in setting the research question or the outcome measures, nor were they involved in developing plans for design or implementation of the study. The ethical committee had a patient representative member. No patients were asked to advise on interpretation or writing up of results. There are no plans to disseminate the results of the research to study participants or the relevant patient community. Between 19 December 2011 and 30 June 2015, a total of 1100 patients were enrolled in the trial. Figure 1 shows that 230 (20.9%) of these patients were not randomised after six months of follow-up. Of the 230 patients that were excluded, 138 were not eligible for randomisation: 55 patients had events during the first six months and 83 did not fulfil the other randomisation criteria. A total of 92 patients were eligible but were not randomised. Among those who were eligible but did not undergo randomisation, the most common reason was withdrawal of consent during the six months between enrolment and randomisation (69 patients). A total of 870 patients were randomised. Complete information on the primary endpoint was obtained for 99% (861/870) of the randomised patient population. Figure 1 shows that at 15 months follow-up, one patient was lost and two patients withdrew consent. For the final 18 months follow-up (ie, 24 months after the primary PCI), six patients were unavailable, but were known to be alive. Table 1 shows that the two treatment groups were well balanced with respect to baseline characteristics. On average, patients were 60 years old and 76.9% of them were male. In the DAPT arm of the trial, six patients received DAPT for fewer than 12 months; two because of bleeding events and four because of poor compliance. In the SAPT arm of the trial, 14 patients received DAPT for more than six months; four took SAPT with P2Y12 inhibitor and 10 continued DAPT without evident reason. These crossovers were based on the patient’s or doctor’s preference. None of these patients had major cardiac adverse events. During the 18 months after randomisation (ie, 24 months after the primary PCI), the primary endpoint, a composite of all cause mortality, any myocardial infarction, any revascularization, stroke, or thrombolysis in myocardial infarction major bleeding occurred in 4.8% in the SAPT group versus 6.6% in the DAPT group (hazard ratio SAPT v DAPT 0.73, 95% confidence interval 0.41 to 1.27; P=0.26). Non-inferiority was met (P=0.004 for non-inferiority), as the upper 95% confidence interval of 1.27 is smaller than the prespecified non-inferiority margin of 1.66 (see table 2 and fig 2). The per protocol analysis of the primary endpoint confirmed the result of the main (intention to treat) analysis (hazard ratio 0.74, 95% confidence interval 0.42 to 1.30; P=0.005 for non-inferiority). The hazard ratio proportionality assumption was examined by graphical checks (see supplementary materials, fig e2) and by applying supremum tests (see supplementary materials, fig e3) using the assess statement in Proc PHREG in SAS. Non-inferiority of SAPT versus DAPT was calculated across different thresholds of the hazard ratio. Table 3 shows that the trial could prove the non-inferiority not only for the chosen non-inferiority margin of 1.66 but for any hazard ratio margin above 1.2. The major secondary endpoint, a composite of safety and bleeding at 18 months (ie, 24 months after the primary PCI), occurred in 3.2% in the SAPT group versus 4.3% in the DAPT group (hazard ratio 0.75, 95% confidence interval 0.37 to 1.49; P=0.40). Between the two treatment groups, there was no statistically significant difference in the incidence of all cause mortality (0.7% v 1.4%, hazard ratio 0.51, 95% confidence interval 0.13 to 2.02; P=0.33); death from cardiac causes (0.5% v 0.9%, 0.51, 0.09 to 2.76; P=0.43); any myocardial infarction (1.8% v 1.8%, 1.02, 0.38 to 2.71; P=0.97); stent thrombosis (0.7% v 0.9%, 0.76, 0.17 to 3.39; P=0.72); stroke (0.7% v 0.7%, 1.02, 0.21 to 5.03; P=0.99); and thrombolysis in myocardial infarction major bleeding (0.2% v 0.5%, 0.51, 0.05 to 5.57; P=0.58)(see table 2). This study is the first dedicated randomised clinical trial to compare six versus 12 months of dual antiplatelet therapy (DAPT) after primary percutaneous coronary intervention (PCI) for ST-elevation myocardial infarction (STEMI). The trial showed that limiting DAPT to six months in patients that were event-free resulted in a non-inferior clinical outcome, as assessed by the patient-oriented composite clinical endpoint of safety, efficacy, and bleeding, versus the currently recommended regimen of 12 months DAPT. Furthermore, no noticeable difference was observed with regard to the major secondary composite endpoint of safety and bleeding. In addition, neither statistically significant nor meaningful numerical differences were observed for the components of the composite endpoints: all cause mortality, any myocardial infarction, any revascularisation, stent thrombosis, stroke, or thrombolysis in myocardial infarction major bleeding. The primary endpoint, as well as all its individual components showed low event occurrence in both treatment arms, suggesting that patients that were event-free at six months remain at a low risk for further events, irrespective of whether DAPT is continued or not. Our findings are in line with those of other randomised studies which compared six versus 12 months of DAPT.222324 Our findings also support the low number of events seen in patients with STEMI after PCI with second generation drug-eluting stents. Another interesting finding which can be observed from the Kaplan-Meier curves is that stopping DAPT (both in the six and 12 months arms) was not associated with a rebound effect on primary endpoint events. This may suggest that DAPT may have no further protective effect beyond these points in time, however, further data are needed to explore specifically the potential rebound effect of DAPT discontinuation at different time points. On the other hand, it is well known that patients with STEMI may have multiple complex coronary plaques, associated with a generally increased risk of adverse cardiovascular events,30 as well as other vulnerable plaques with traits of instability elsewhere in their coronary tree.31 Nevertheless, remaining complex “non-culprit” lesions are now generally treated after or even during the primary PCI. Regarding the remaining non-significant lesions with traits of “vulnerability,” the current understanding is that many of these characteristics may be short lived, as in most cases these plaques progress through a process of asymptomatic plaque rupture and healing to more stable atherosclerotic lesions while other plaques remain unchanged.32 Therefore, based on this understanding of atherosclerosis progression, it is much more likely that these plaques may remain clinically silent or manifest as stable rather than an acute coronary syndrome. As such, while DAPT as secondary prevention may reduce cardiovascular events originating from atherosclerosis progression elsewhere in the coronary tree,3334 these events are rare and the benefits of the reduction of ischaemic events may not outweigh the increase in the risk of bleeding, related to prolonged DAPT, as recently shown in the Pegasus and DAPT trials.3335 Major bleeding is an adverse event that is strongly related to mortality.36 Recent studies have even shown that bleeding is a stronger predictor of non-cardiovascular mortality than thromboembolic and ischaemic events.3637 Indeed, prolonged DAPT did not impact mortality in the Pegasus and OPTIDUAL trials,3338 but it was associated with a higher all cause mortality in the DAPT trial.35 Based on this evidence and considering that atherosclerosis is a lifelong disease, the role of DAPT in secondary prevention remains questionable. While DAPT does not have a major impact on the progression of atherosclerosis which in a large extent is based on rupturing and healing plaques, it might have some impact on its clinical presentation. In other words: the use of DAPT may result in more patients presenting with stable angina pectoris rather than acute coronary syndromes.39 As this could influence the need for ischemia-driven revascularization during the treatment period, we incorporated the endpoint “any revascularisation” into the primary clinical endpoint of our trial. Finally, given the potential trade-off between ischaemic versus bleeding risks for any given duration of DAPT, the use of scores might prove useful to tailor DAPT.11 However, while the DAPT score estimates ischaemic and bleeding risks for prolonged DAPT and the PRECISE DAPT and PARIS risk scores predict bleeding during DAPT supporting clinical decision making for treatment duration, none of these risk prediction models have been prospectively tested in the setting of a randomised controlled trial, and even less in patients with STEMI.40414243 Therefore, the value of the risk scores in improving patient outcomes remains unknown. This study has limitations. The primary endpoint is a combined endpoint of major adverse cardiac and cerebrovascular events and bleeding. While this endpoint might not give clear insights for each of these components, considering the bivalent impact of DAPT so much in ischaemic as well as bleeding outcomes we believe this endpoint gives better insights to the overall patient outcome. Moreover, individual clinical endpoints were not in opposite directions when comparing DAPT versus SAPT. Excluding the patients with events in the 6 months does indeed introduce a bias of patients at low risk, however, rather than being a selection bias, it reflects more the trial design. In this trial, the rate of patient enrolment was not high. This may reflect the absence of previous data in this setting and the difficulty of obtaining patient consent to participate in the trial, this was also reflected by the high number of withdrawals at six months. The lower than estimated occurrence of events in both arms, may be perceived as another limitation of this trial, but reflects the design of this trial: only patients that were event-free at six months were randomised, which may have excluded a certain proportion of patients at higher risk from randomisation. Furthermore, the observed event occurrence is in line with previous trials performed with modern drug-eluting stents.2344 To avoid the biases that the low event occurrence could introduce to a non-inferiority design based on a fixed percentage of the expected event, we chose a non-inferiority design based on hazard ratios. In this model, lower than expected event occurrence would enlarge the confidence intervals and therefore challenge the non-inferiority, however, this was not the case in our trial as the hazard ratio was 0.73 and the upper confidence interval was 1.27, much lower than the prespecified margin of 1.66. Considering that our endpoint did combine ischaemic and bleeding events, we were expecting a benefit for SAPT,23333544 and therefore we could have chosen a more conservative non-inferiority margin than 1.66, however, taking into account a possible chance finding (a benefit in favour of DAPT) we chose a wider margin. It has to be noted that the large non-inferiority margin did not influence the observed non-inferiority as a post hoc analysis showed that the trial would have proved non-inferior even for a much more conservative non-inferiority margin of 1.3 (see table 3). Another limitation is that fewer patients than predicted were randomised at six months follow-up. The design of the trial in which only patients that were event-free at six months could be randomised contributed to this issue; other reasons were the higher than expected number of withdrawals and the treatment of non-culprit coronary lesions outside the prespecified accepted time window for staged PCI procedures, which we could not predict when designing the trial. Indeed, the last reason also explains in part why the number of non-culprit coronarylesion treatments in this trial appears low. However, a post hoc analysis showed that the number of actual versus planned patients that were randomised had only a minimal influence in the trial power reducing it by only 3%. The time from the onset of pain until revascularisation as well as door to balloon time were not recorded in this trial, however, considering that the randomisation occurred only at six months in patients that were event-free, such information would not importantly impact the trial outcomes. Per protocol, the choice of the P2Y12 inhibitor prescribed was at the operators’ discretion reflecting the guidelines when this trial was designed. As can be observed in the baseline table, the different P2Y12 inhibitors were similarly distributed between treatment groups. Different P2Y12 inhibitors have different outcomes in safety endpoints or bleeding;45 however, potential differences in outcomes between patients treated with different P2Y12 inhibitors can only be appreciated in studies with much larger population sizes than our present trial. Furthermore, because we used a composite endpoint, any possible advantage of prasugrel or ticagrelor in ischaemic outcomes is counterbalanced from the bleeding outcomes. We do not expect that clopidogrel introduced any bias in our results, and if so it would rather underestimate the benefit of SAPT. Moreover, according to guidelines when neither prasugrel or ticagrelor are available, or if they are contraindicated, clopidogrel should be prescribed. Thus the presence of clopidogrel in our trial may still be of importance for those patients that are treated with clopidogrel, especially in countries which, for economic reasons, cannot afford the cost of new P2Y12 inhibitors. The Resolute Integrity second generation zotarolimus-eluting stent was used in 93% of the patients and thus further studies with other second generation drug-eluting stents will be required to establish the extension of this finding. Finally, although cardiogenic shock was not an exclusion criteria for enrolment, patients with overt cardiogenic shock were not enrolled because they were not able to provide informed consent and therefore, the results of this trial cannot apply to these patients as well as for patients with lesions requiring left main stenting who were excluded from the trial. In patients that are event-free six months after primary PCI with second generation drug-eluting stents, six months of DAPT was associated with outcomes not inferior to those observed after 12 months of DAPT. While larger trials have shown that longer duration of DAPT regimens might be associated with favourable ischaemic outcomes, this trial for the first time shows that a shorter DAPT duration is also feasible and safely applicable if clinically required even in patients with STEMI, setting the stage for further dedicated research on DAPT duration in this category of patients that are at high risk. We thank statisticians from University of Sahlgrenska, Gothenburg, Sweeden; University of Amsterdam, Amsterdam, Netherlands; and Diagram BV (CRO) for performing the statistical design and analysis. Contributors: EK conceived and designed the study. HW performed the power calculation. RD performed the statistical analysis. EK and EF prepared the first draft of the manuscript. All other authors acquired the data, critically revised the manuscript, and approved the final manuscript. All authors had full access to the data in the study and can take responsibility for the integrity of the data and the accuracy of the data analysis. EK is the guarantor. Funding: The trial was sponsored form the Maasstad Cardiovascular Research Rotterdam, The Netherlands and from an unrestricted research grant from Medtronic. Competing interests: All authors have completed the ICMJE uniform disclosure form at www.icmje.org/coi_disclosure.pdf and declare: no support from any organisation for the submitted work other than those listed above; no other financial relationships with organisations that might have an interest in the submitted work in the previous three years; no other relationships or activities that could appear to have influenced the submitted work. Ethical approval: This study was conducted in accordance with the Declaration of Helsinki and was approved by the local research ethics committee. Data sharing: The dataset is available on written request to the corresponding author. Transparency: The manuscript’s guarantor (EK) affirms that the manuscript is an honest, accurate, and transparent account of the study being reported; that no important aspects of the study have been omitted; and that any discrepancies from the study as planned and registered have been explained. .Clopidogrel or ticagrelor in acute coronary syndrome patients treated with newer-generation drug-eluting stents: CHANGE DAPT. EuroIntervention2017;13:1168-76. doi:10.4244/eij-d-17-00634.